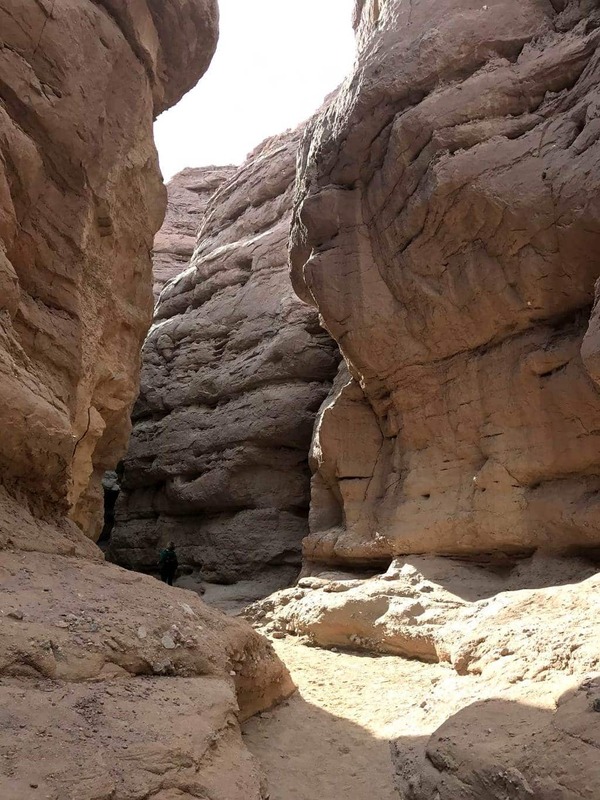 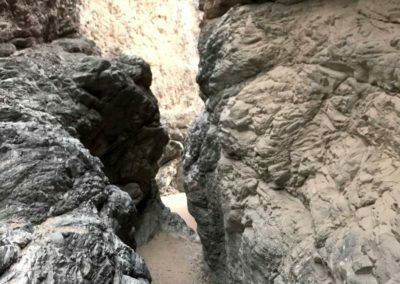 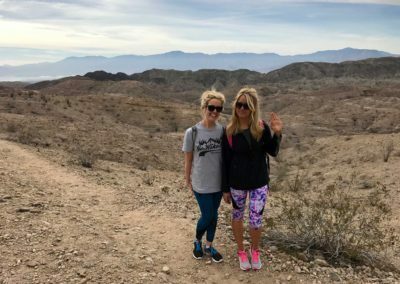 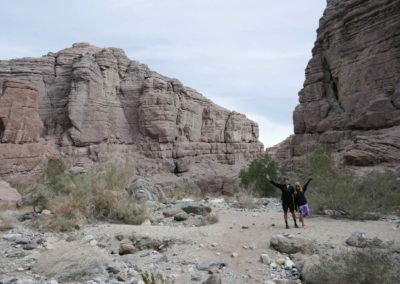 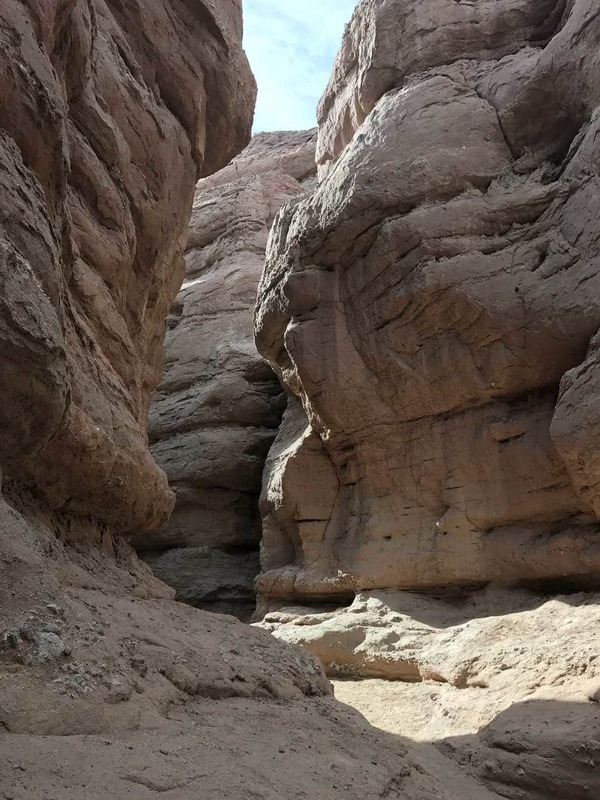 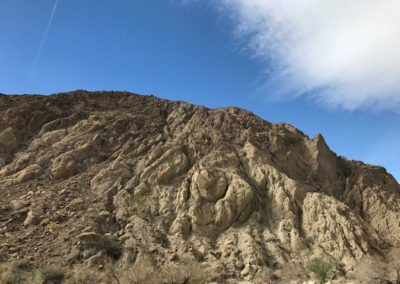 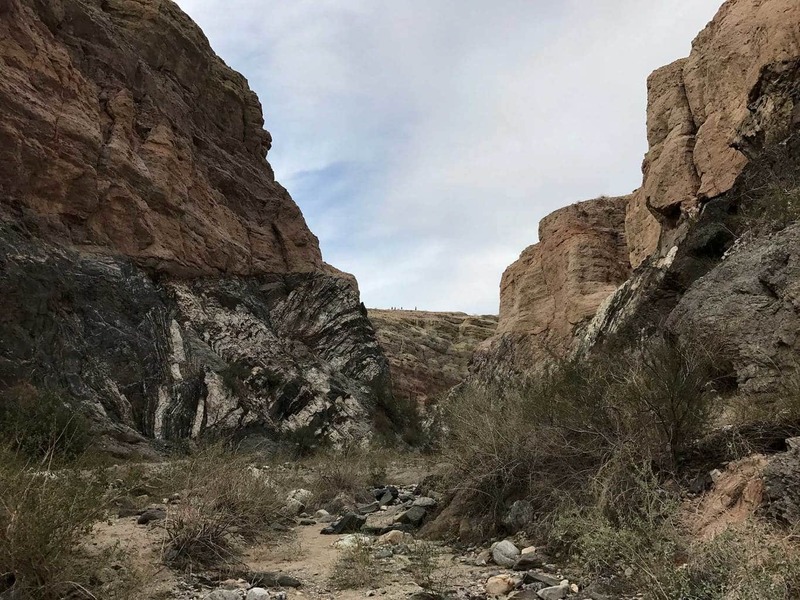 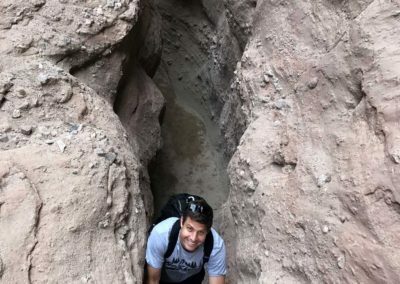 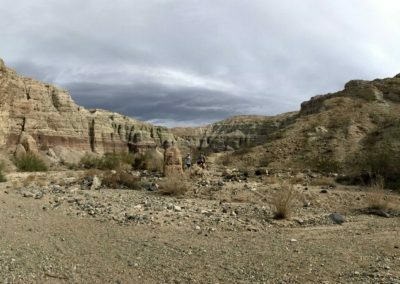 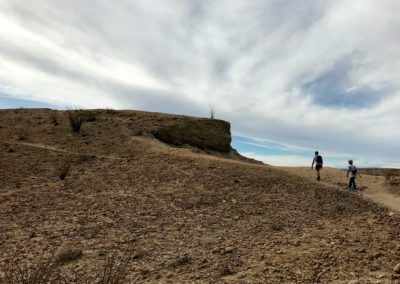 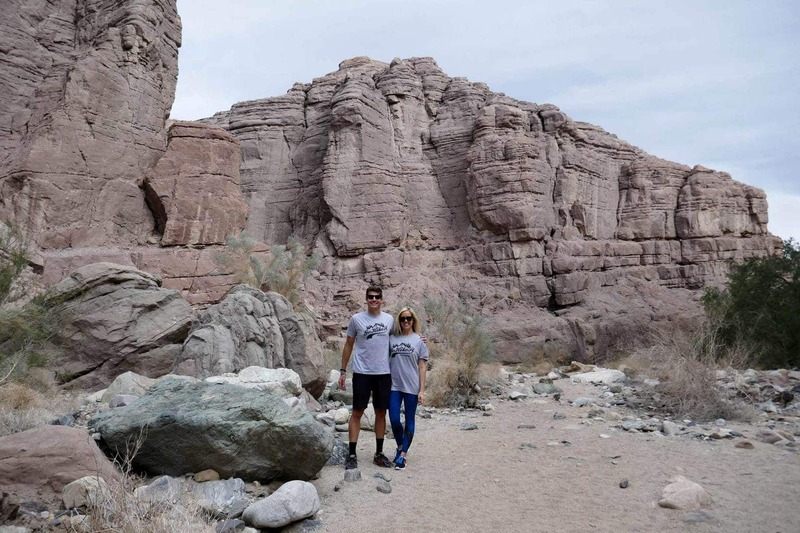 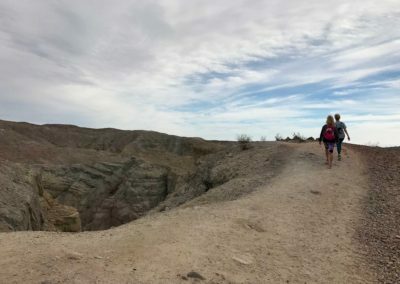 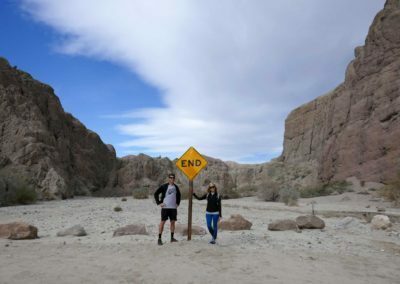 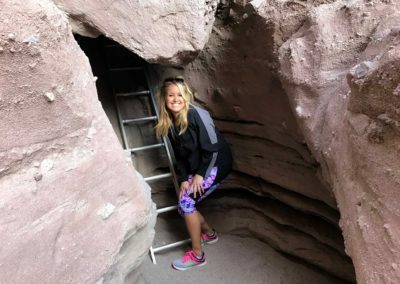 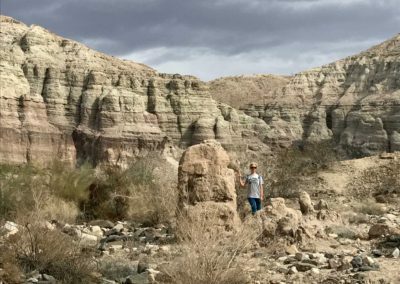 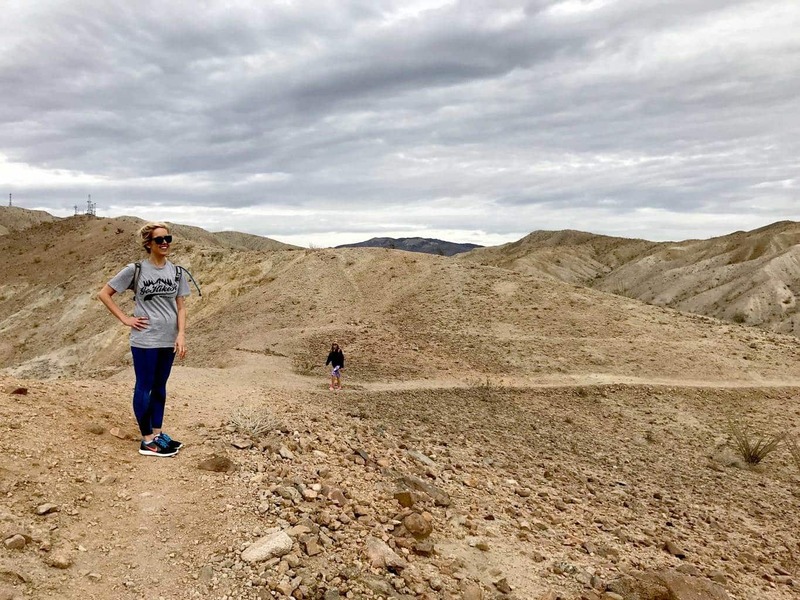 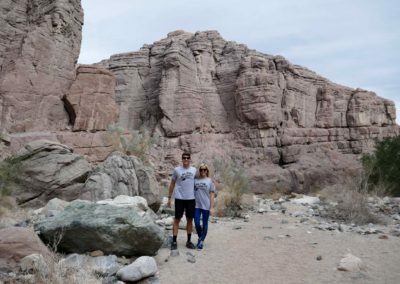 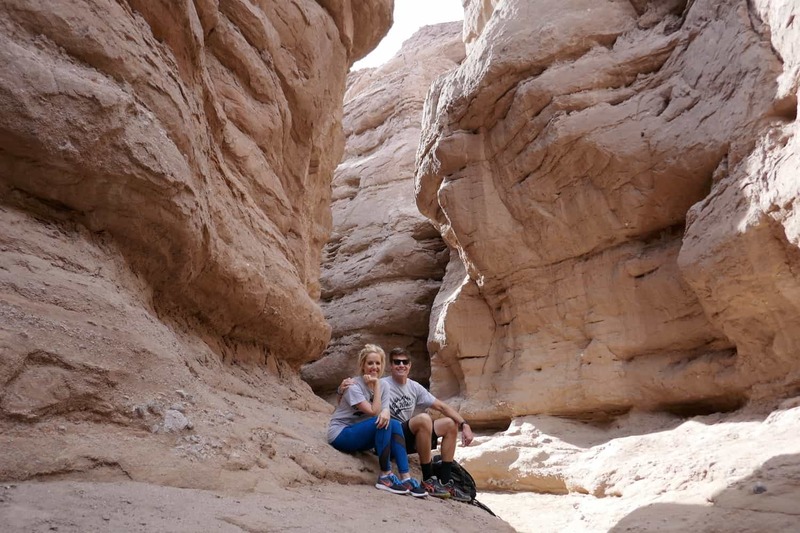 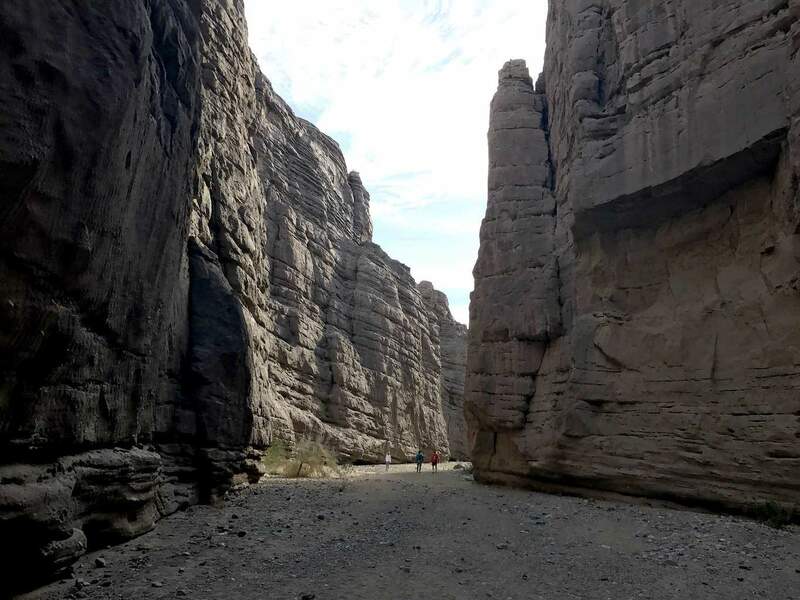 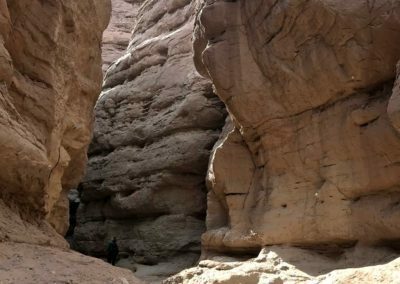 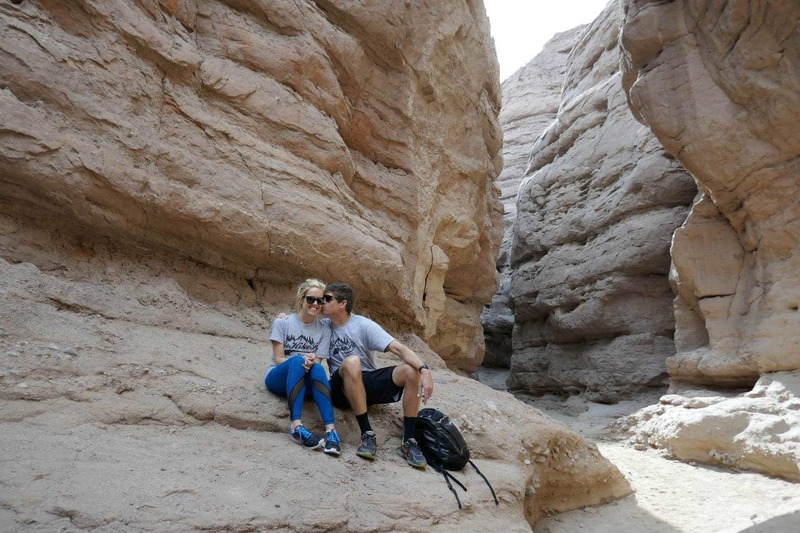 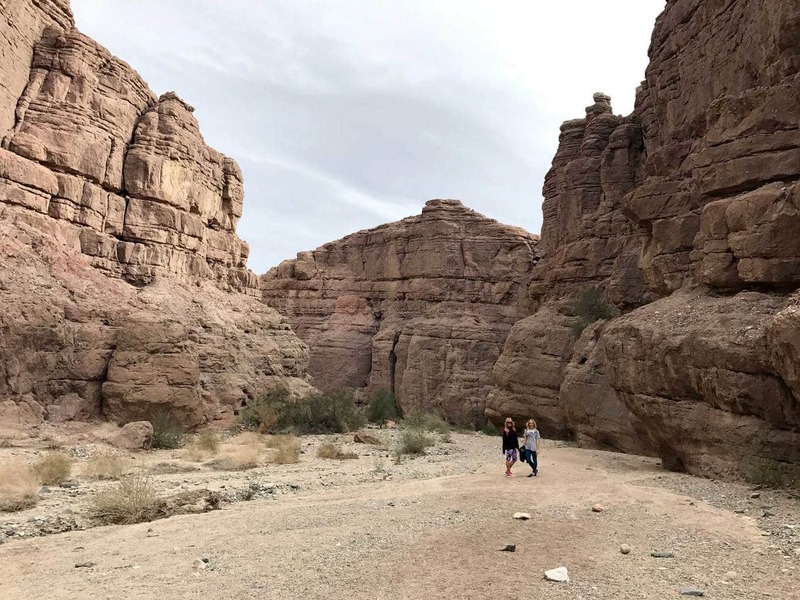 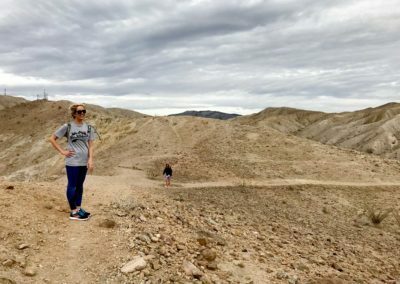 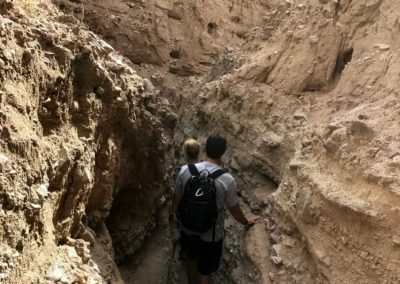 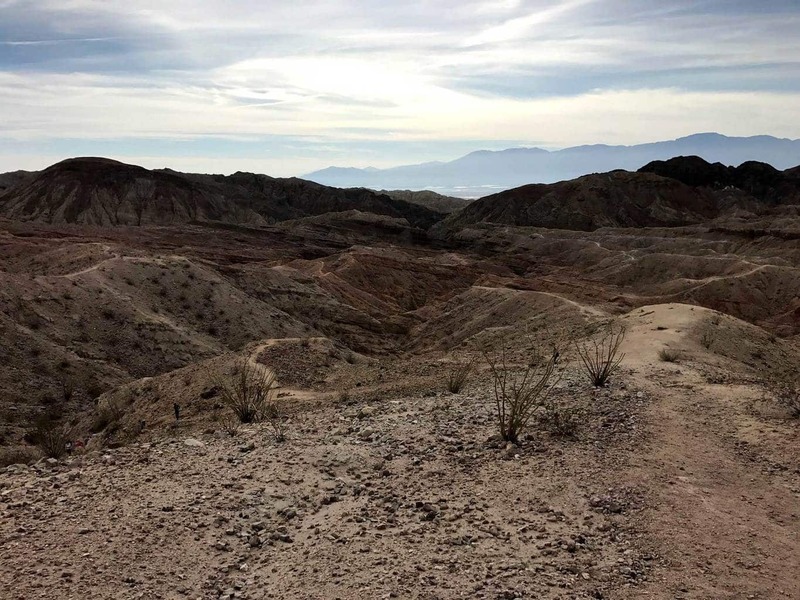 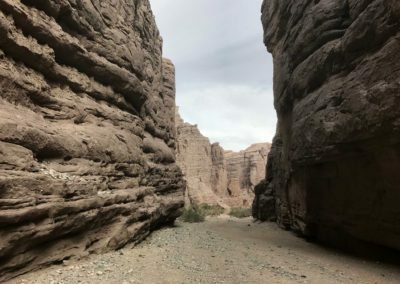 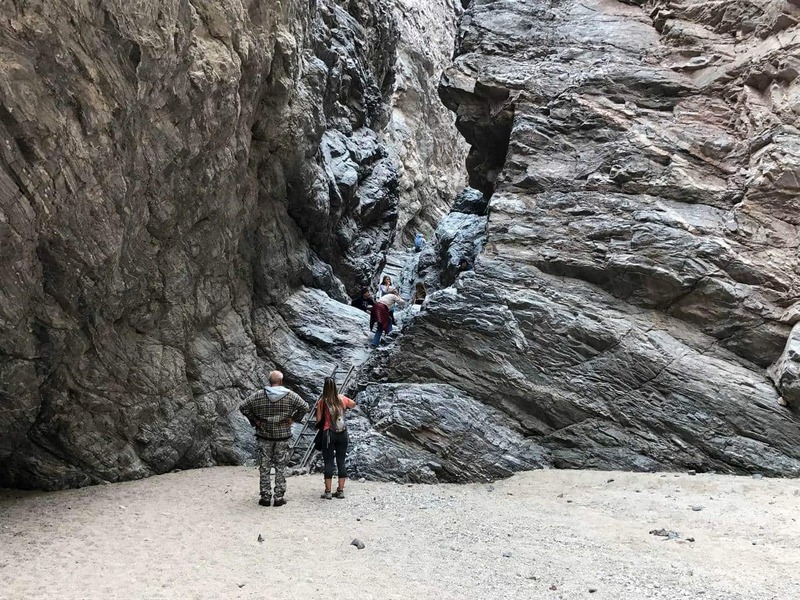 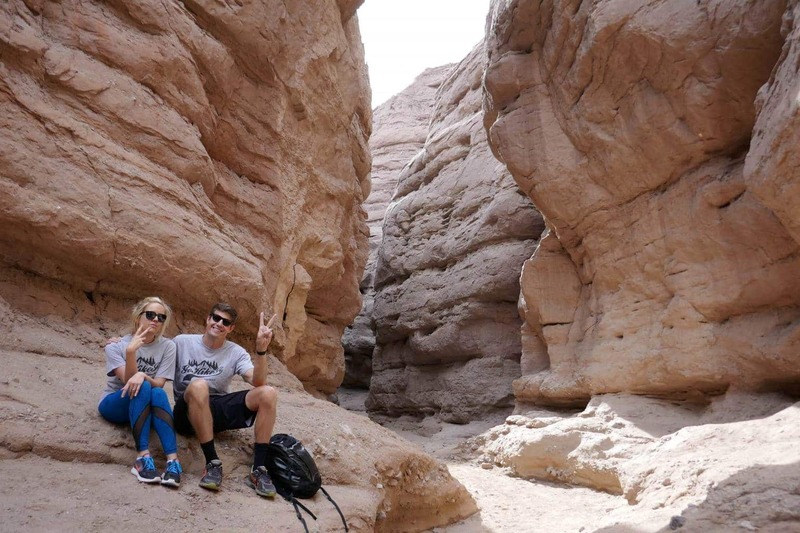 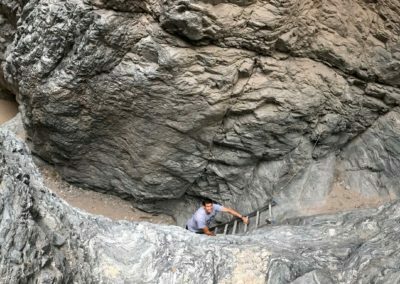 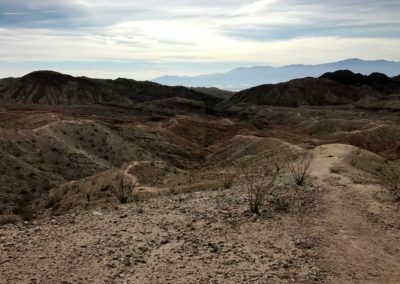 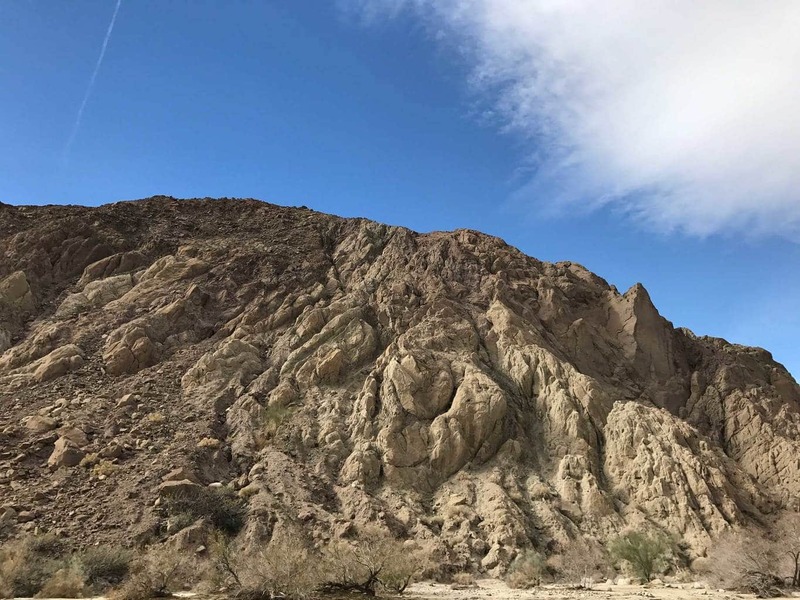 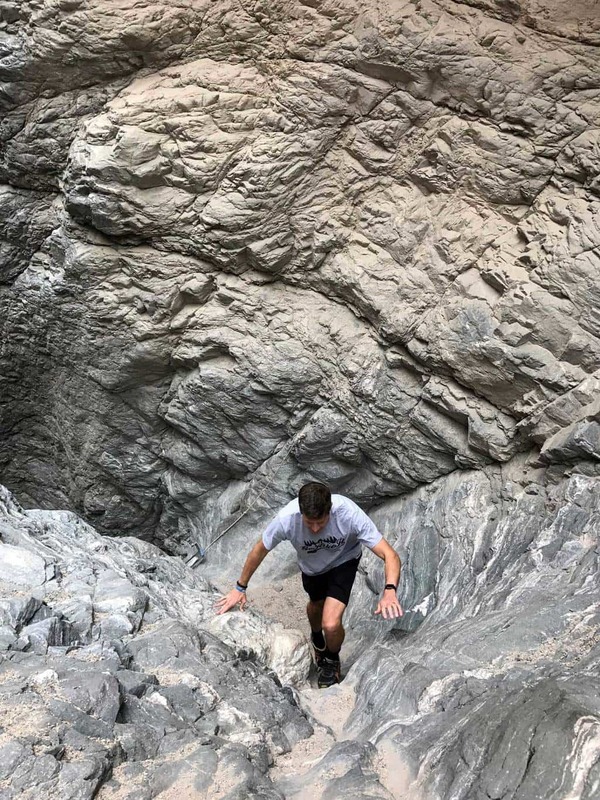 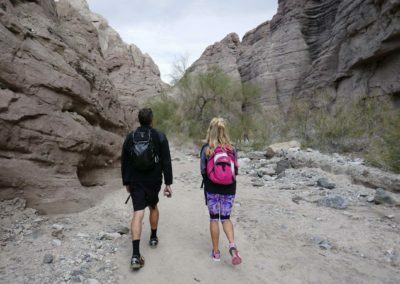 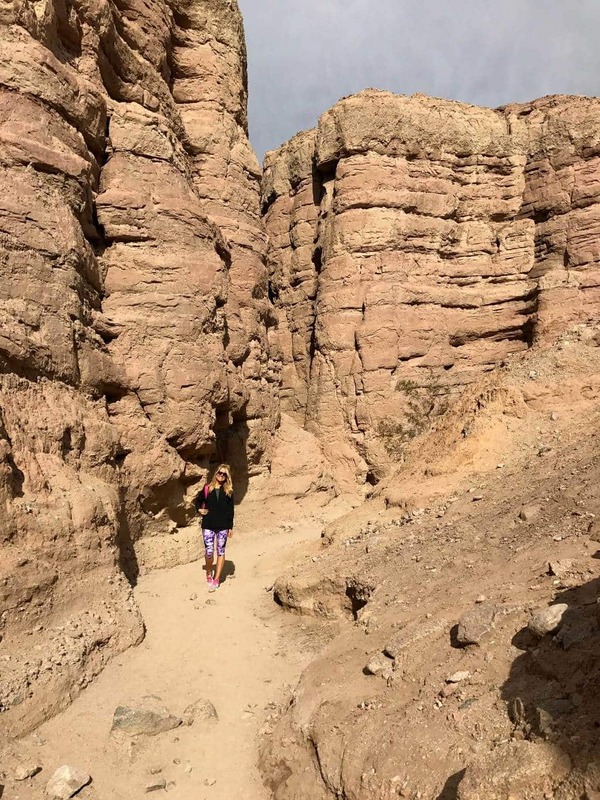 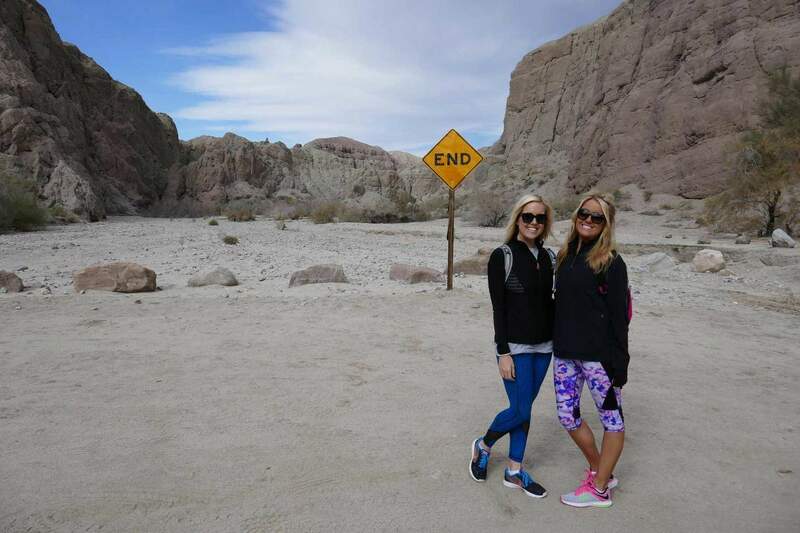 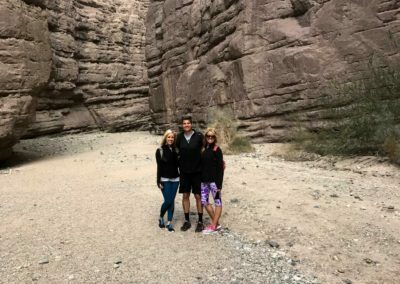 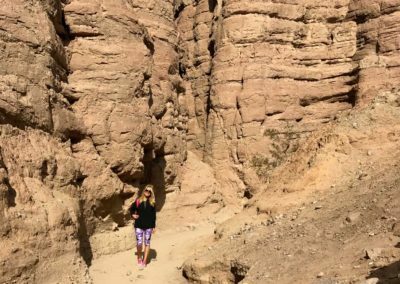 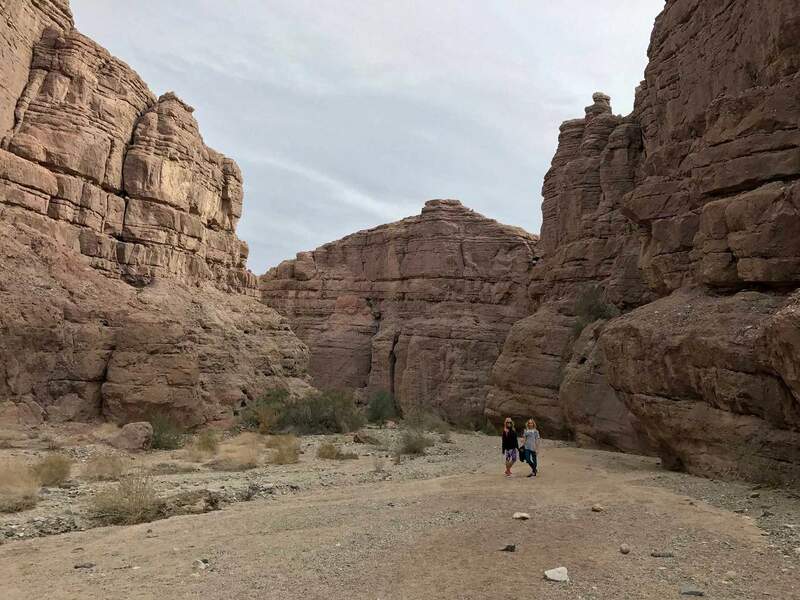 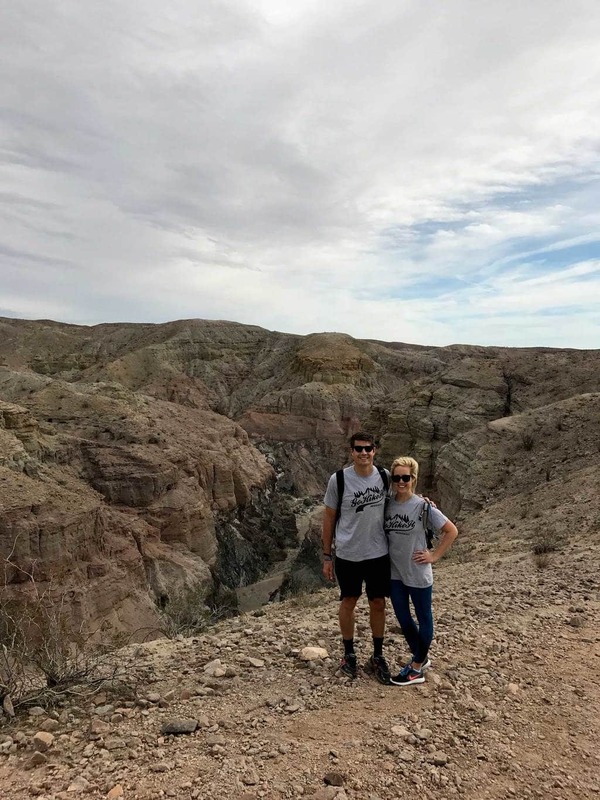 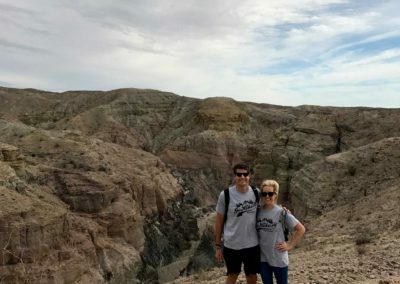 Mecca Hills Painted Canyon Trail: Located approximately 40 miles or a 1-hour drive from downtown Palm Springs, The Painted Canyon Trail Ladder hike is an EPIC adventure! 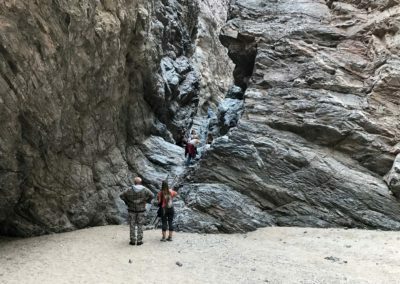 The 6-mile round trip trail features slot canyons, ladders, and countless photo opportunities. 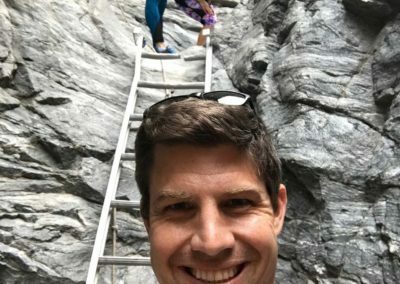 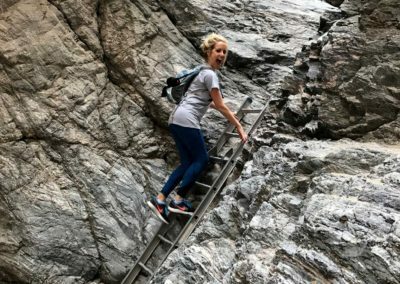 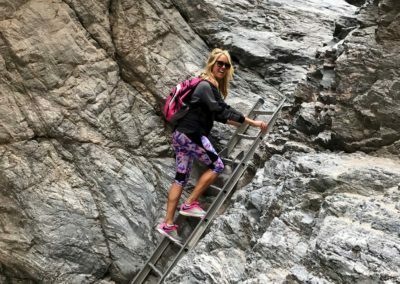 You’ll feel as though you’ve stepped into a movie adventure as you traverse up ladders and canyon slots along the trail route. 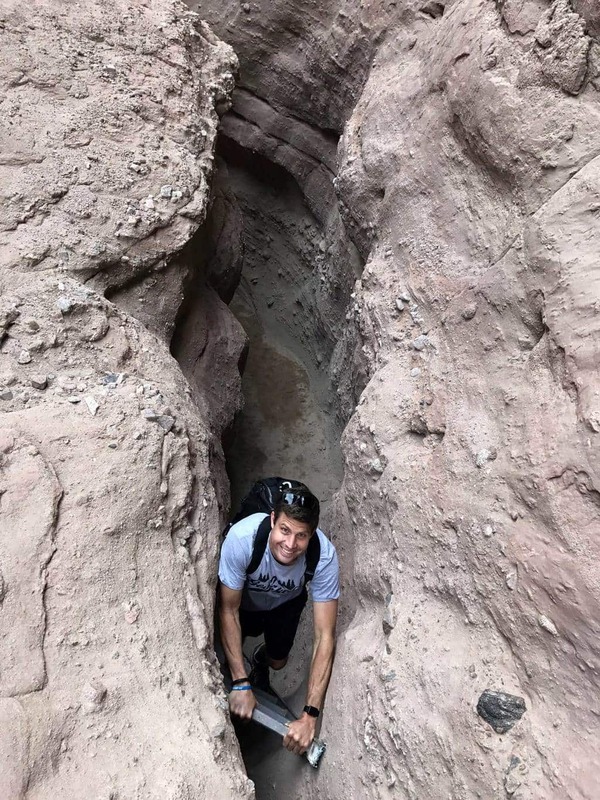 The slot canyons were formed by the San Andreas Fault pushing the North American Plate into the Pacific Plate. 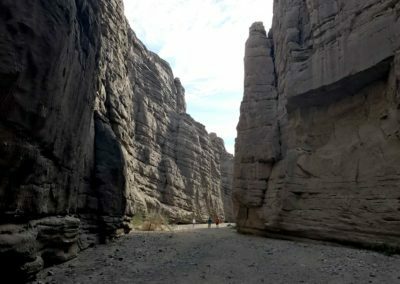 The plate’s shift caused narrow passages & canyons to form. The area’s geographic formations are breathtaking and unusual compared to other canyons in the Palm Springs area. 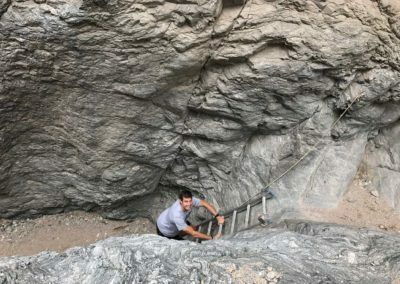 Unlike other trails in the area, the Painted Canyon Ladder’s trailhead is very remote and isolated. 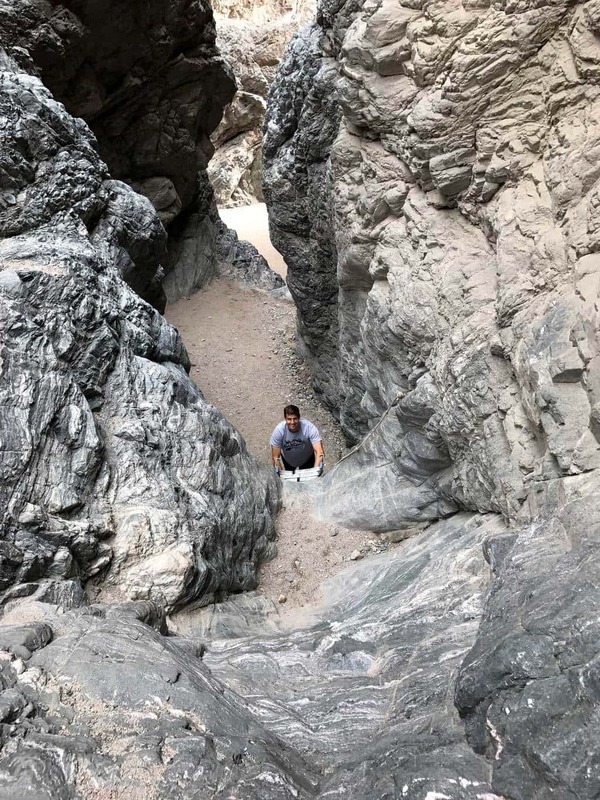 It’s accessible by four-wheel drive or high clearance vehicles, which can handle the 4-5 mile drive along the bumpy Box Canyon Road. 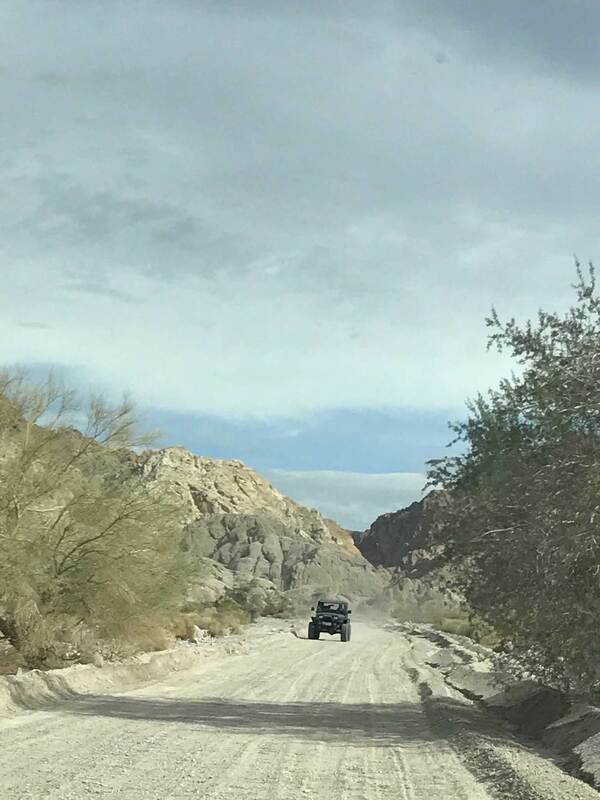 Make sure to check the weather report and visit the Riverside County’s transportation website to make sure the road is open prior to your visit. 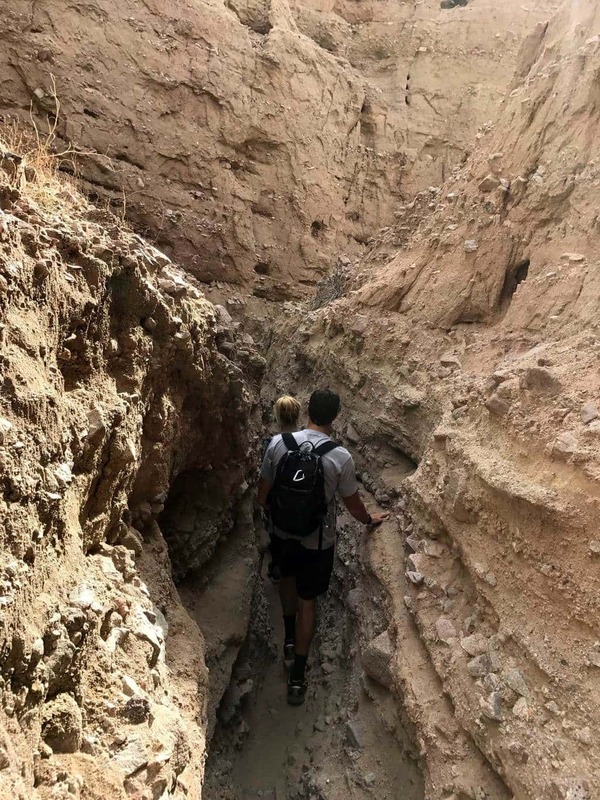 Additionally, it’s highly recommended to bring plenty of extra water, snacks, and a first aid kit as the trail area is very remote and away from immediate or close help. 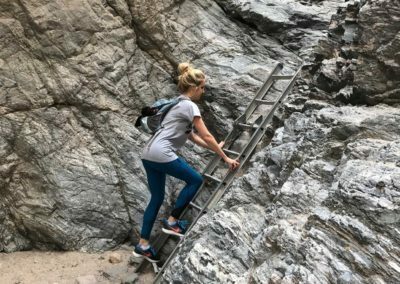 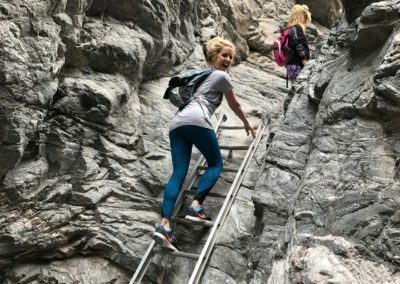 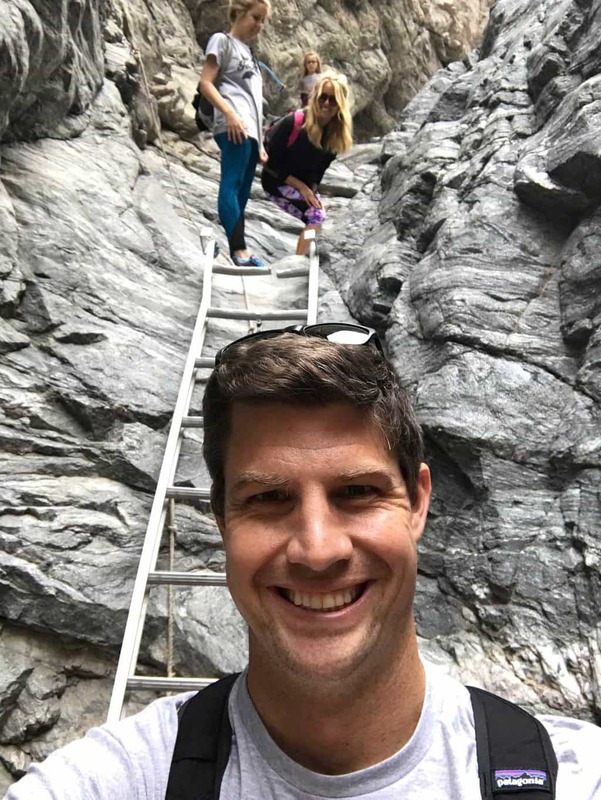 Although remote and isolated, Painted Canyon Ladder hike is an incredible adventure and one of the best in Southern California! 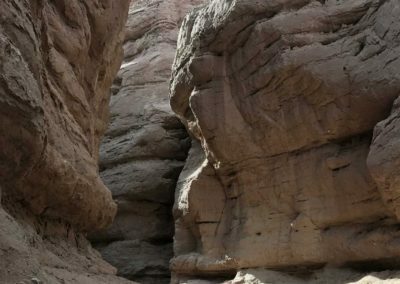 Painted Canyon derives its name from the mineral pink, rose, purple and gold mineral hues. Follow the large rock arrow marks to help stay on the trail loop. 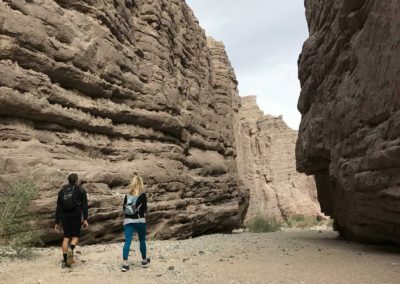 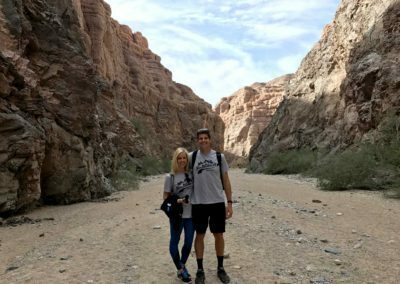 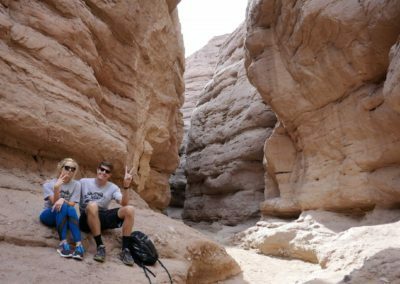 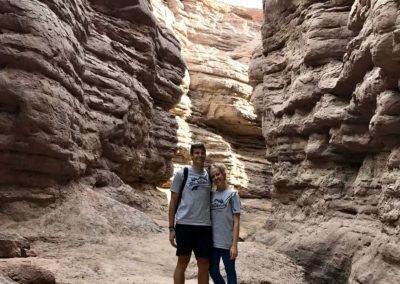 Year-Round: It’s best to enjoy the Ladder Canyon hike in late fall, winter or early spring, when it’s typically cooler in the dessert area. 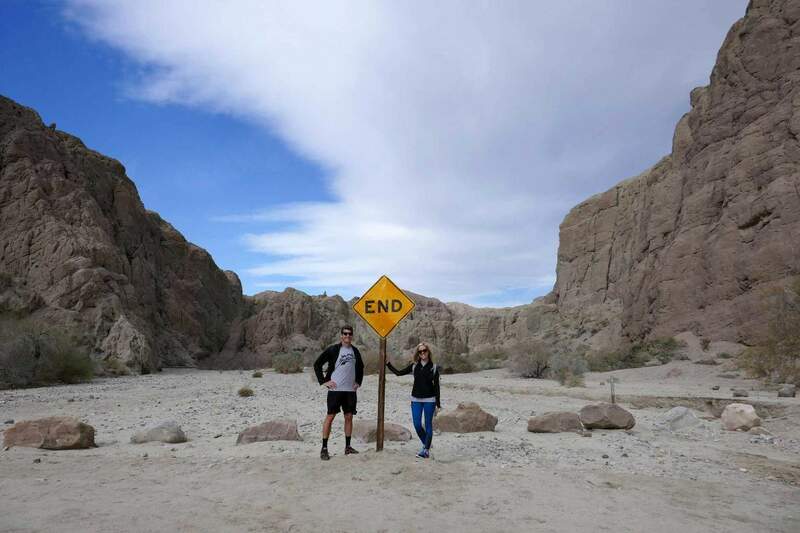 However make sure to check the weather prior to your visit. 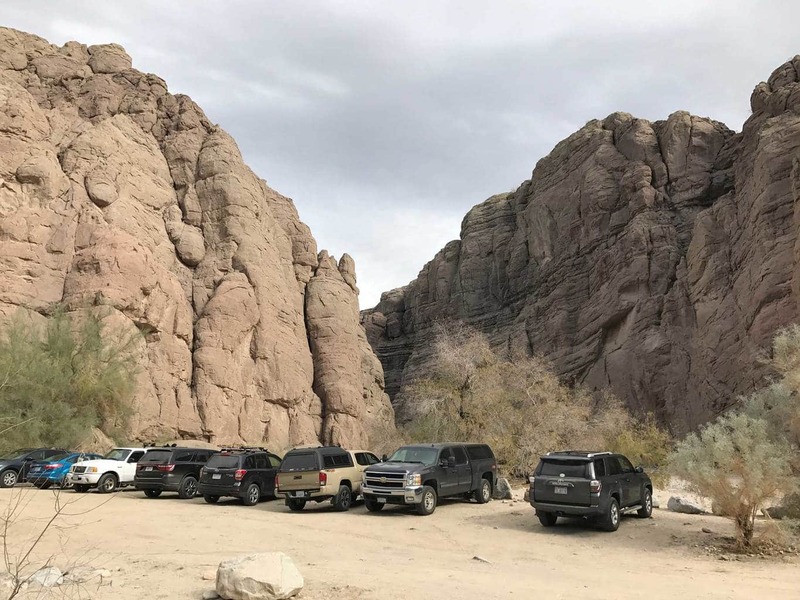 If it has rained or is predicted to rain, postpone your trip to help avoid any driving or hiking trail issues. 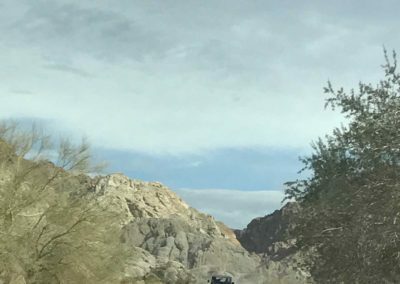 Check the Riverside County’s Transportation Website to see if there are any Painted Canyon Rd closures. 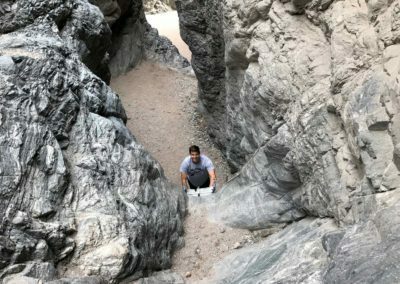 Yes, dogs are permitted on leashes in the Ladder Canyon Hike. 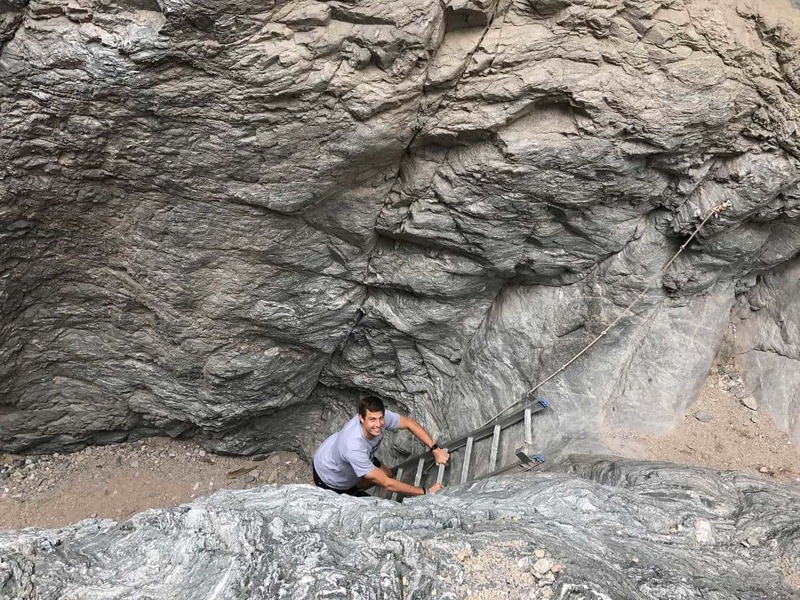 However, it may be a challenge to maneuver the dogs up and down some of the ladders and it is not highly recommended to bring any dogs. 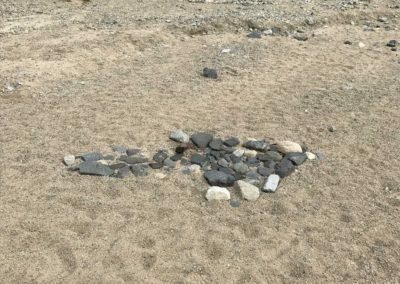 Barry-the-Bear: Unbelievable! 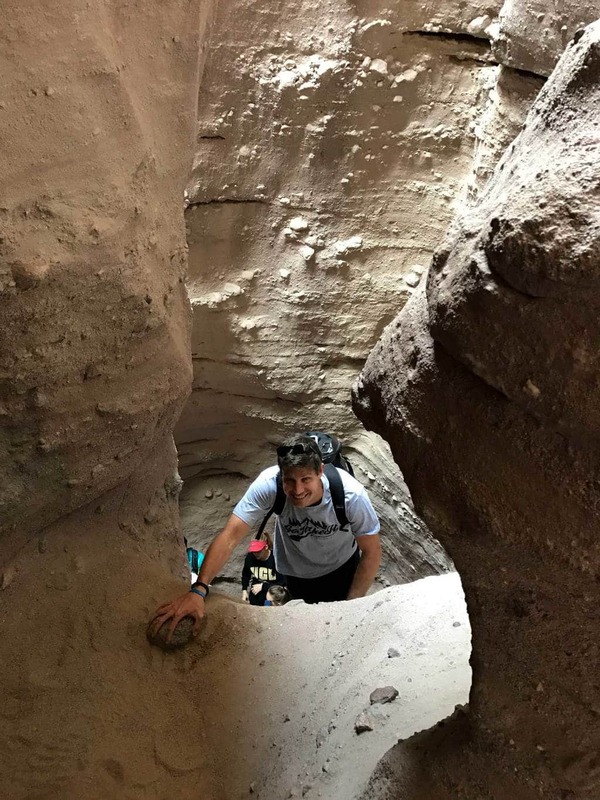 It was an epic adventure to scale the 4 ladders and wedge my beary body through the slot canyons. 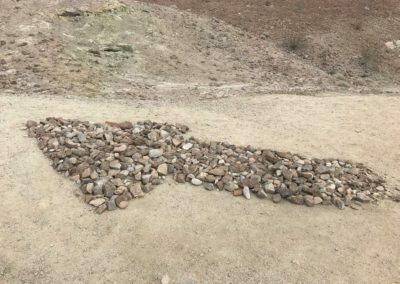 Larry-the-Lion: Awesome! 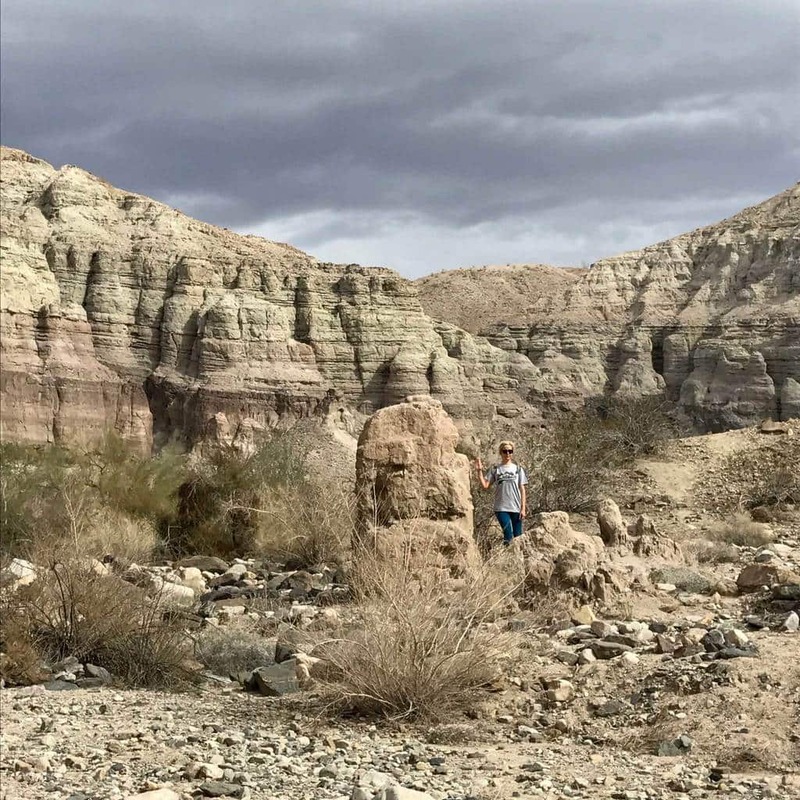 There were so many incredible photo opportunities throughout the Mecca Hills area. 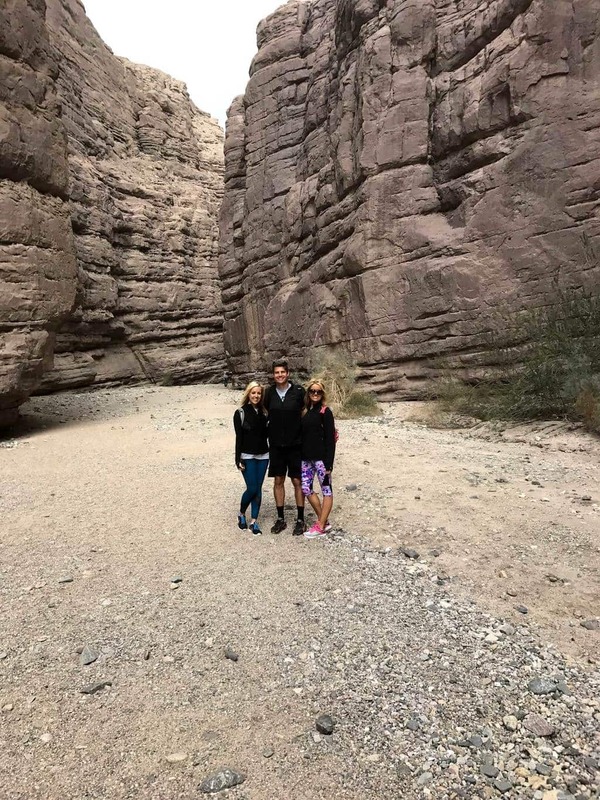 We loved exploring the canyons and walking along the trail’s perimeter. 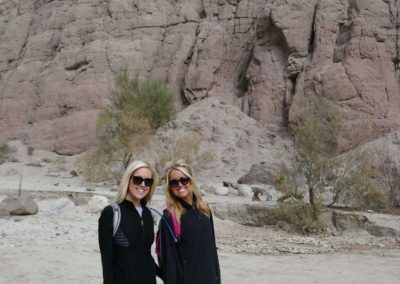 We’re glad we brought plenty of water and sun protection. 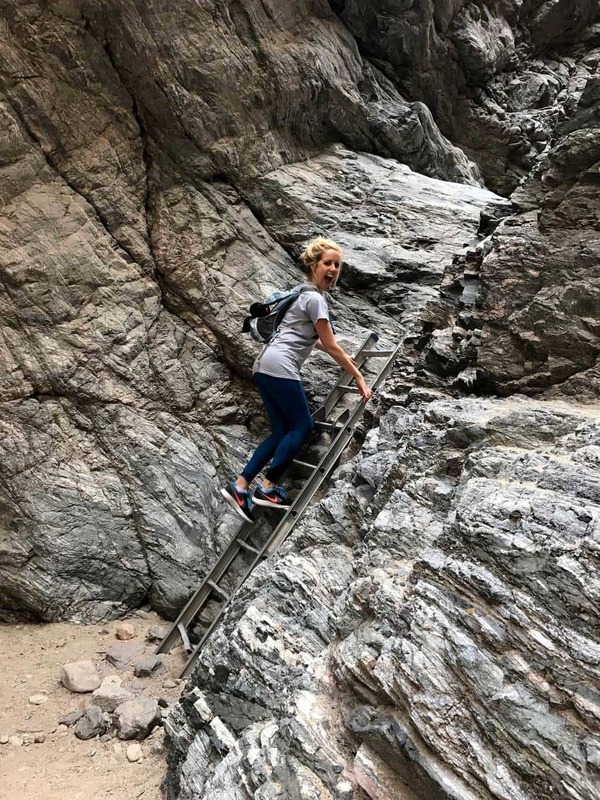 Chris-the-Cheetah: The hike was a challenge, even for this Cheetah. 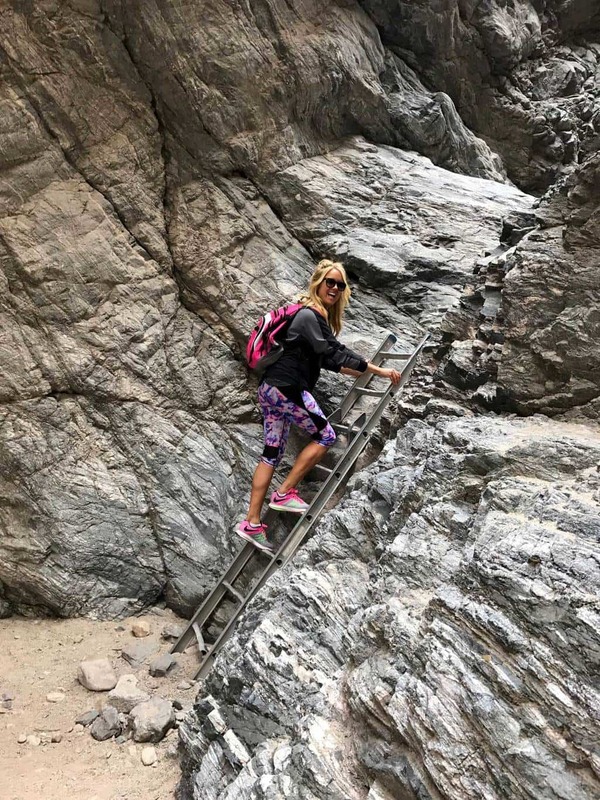 The Painted Canyon Ladder Hike was an epic adventure! 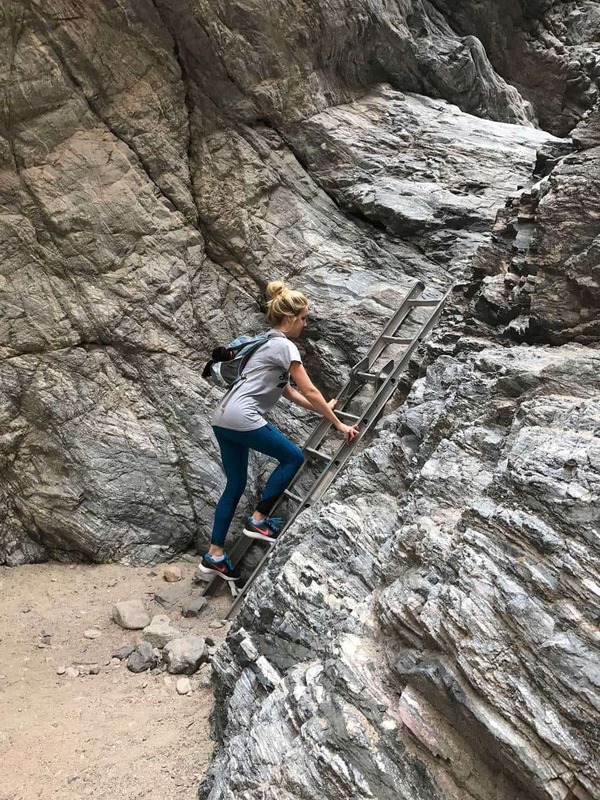 From the drive out to the trailhead to the walk throughout the canyons to traversing the ladders, we enjoyed the constantly changing environment and dynamic experience. 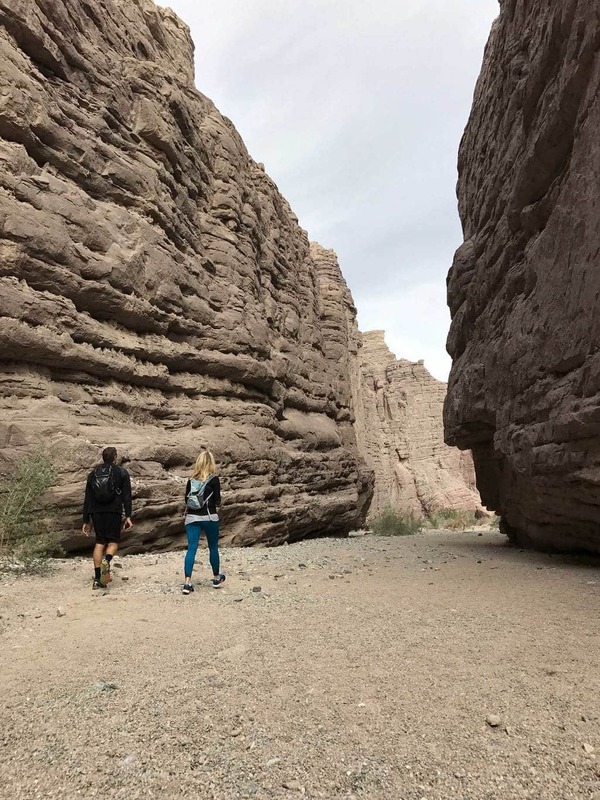 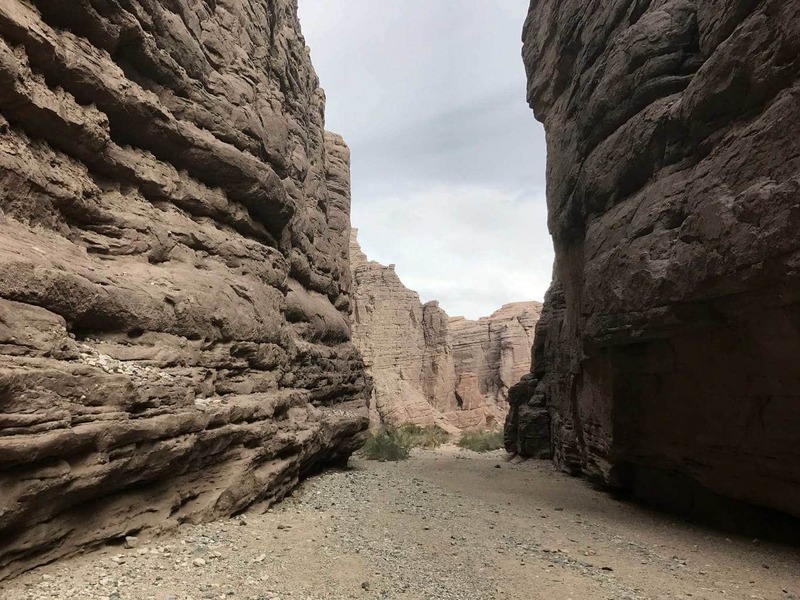 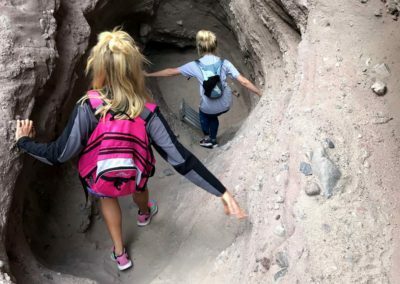 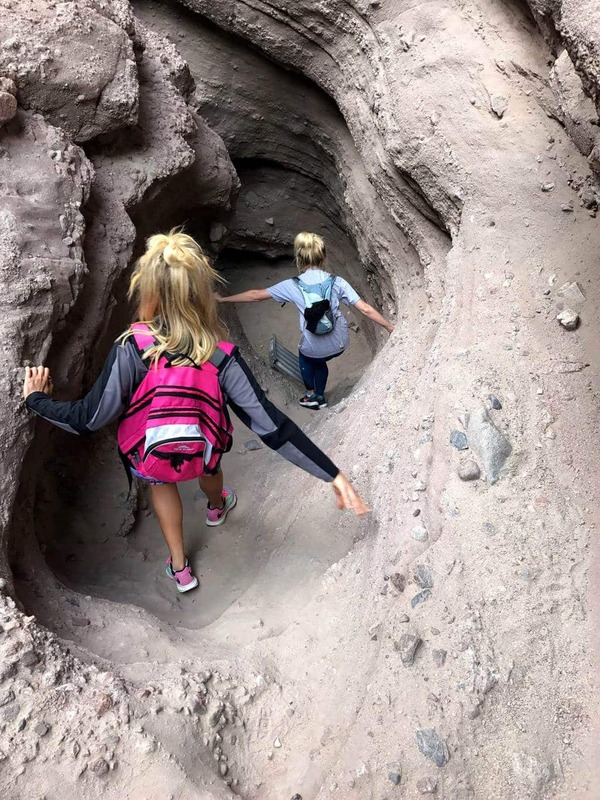 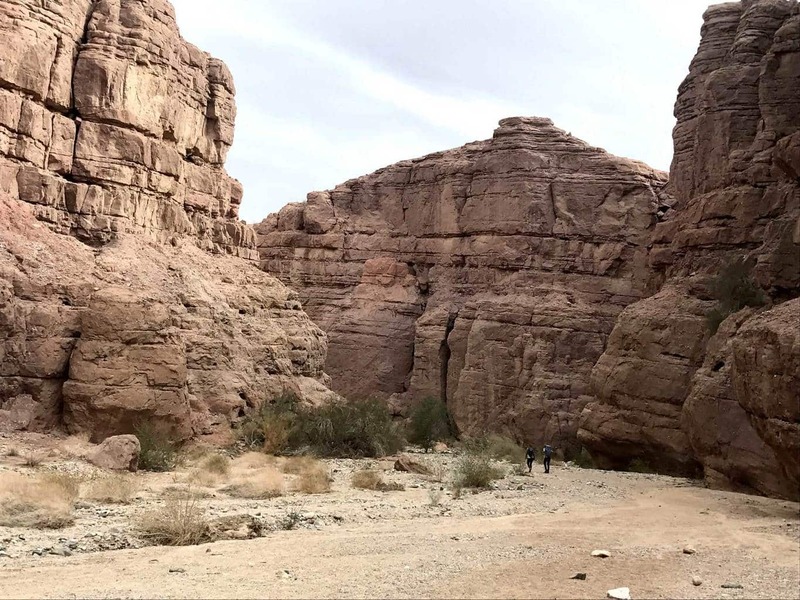 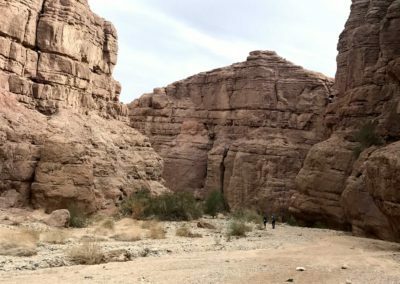 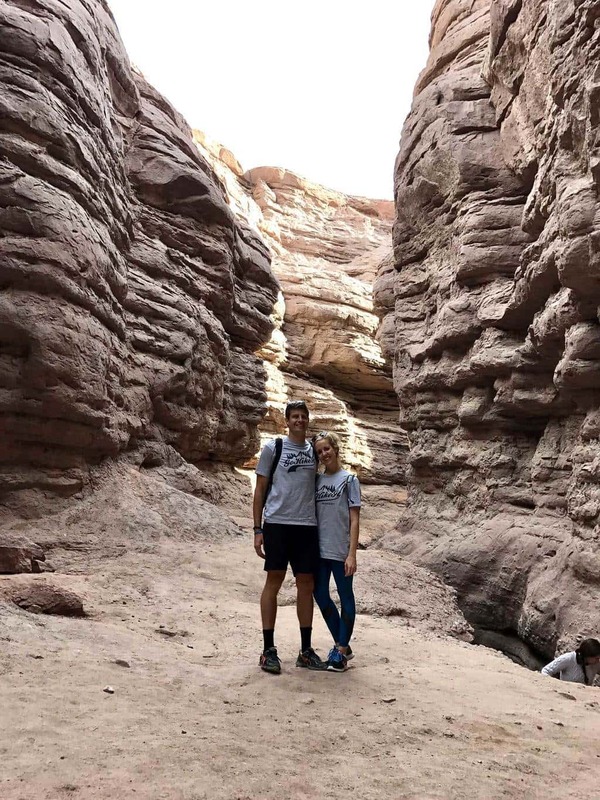 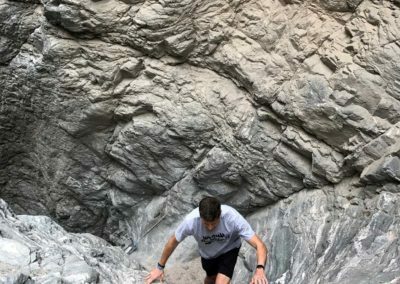 We nicknamed the hike “the mini grand canyon” as various sections of the canyon and the perspective of hikers walking inside the mountainous walls, made it feel grandiose and reminiscent of actual Grand Canyon. 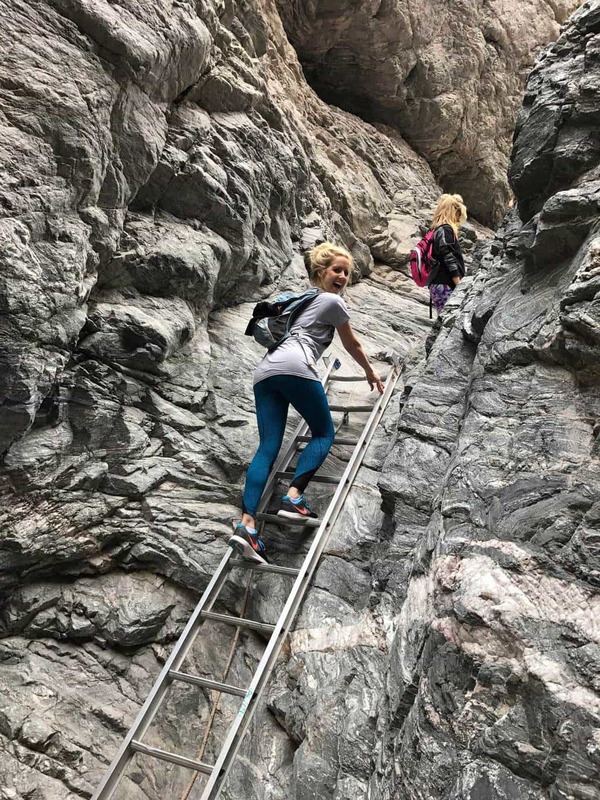 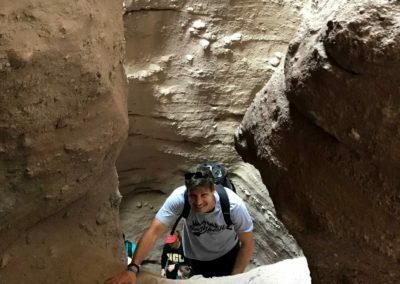 Overall, the Painted Canyon Ladder hike is an astonishing adventure to share with friends and one that we look forward enjoying again! 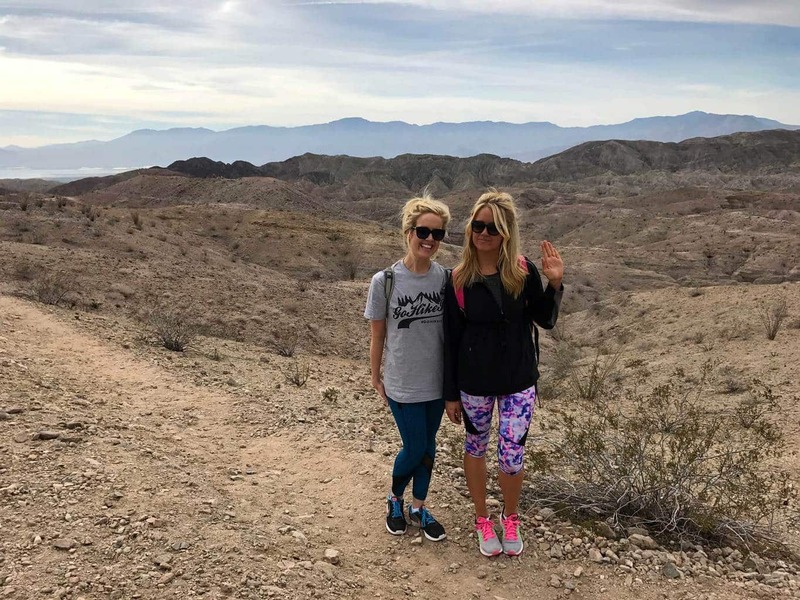 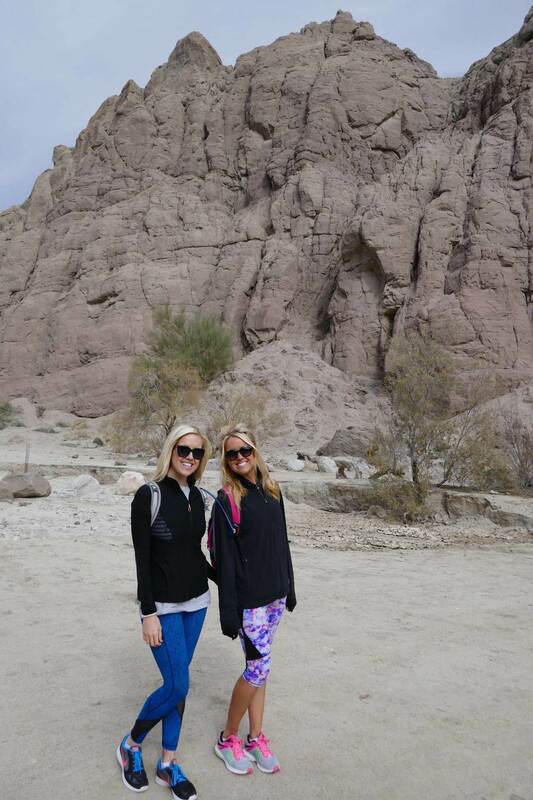 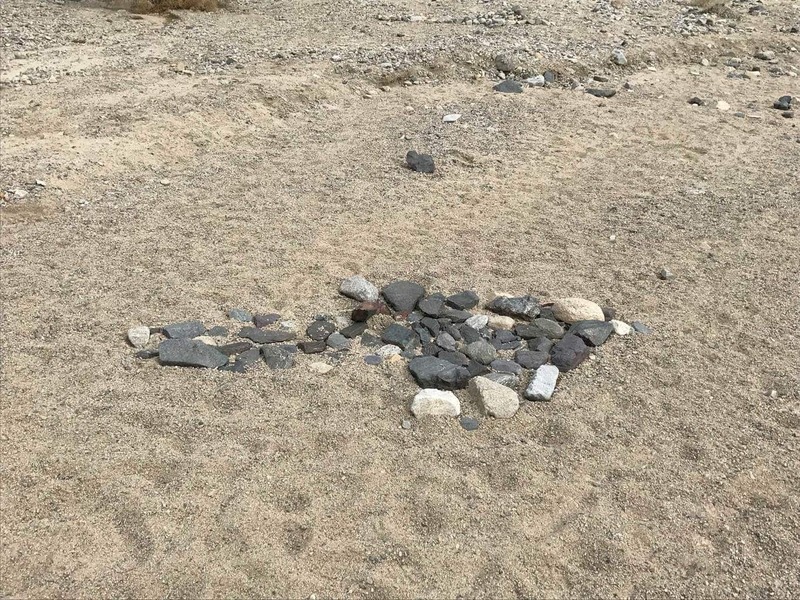 Have you hiked in Palm Springs? Leave a comment and share your favorite trail!